The Book of Hosea is one of the books of the Hebrew Bible and the Christian Old Testament. It stands first in order among what are known as the twelve Minor Prophets. It contains the prophecies of Hosea, one of the first literary prophets. The book is particularly memorable for its poignant descriptions of God's love for Israel in spite of her faithlessness. This relationship is dramatically paralleled by Hosea's relationship with his own wife, Gomer. The later chapters of the book contain other prophecies concerning Israel and Judah, threatening grave punishment, especially to the northern kingdom, if it does not repent. As one of the earliest prophets who left a written record of his oracles, Hosea was greatly influential on later prophets such as Jeremiah, Ezekiel and others. He is also quoted by Jesus in the New Testament. Hosea, son of Beeri, was the second of what are deemed the “minor classical prophets.” He prophesied in the northern kingdom of Israel for about 38 years in middle of the eighth century B.C.E. beginning during or shortly after the ministry of Amos. Hosea was the only one of the literary prophets to come from the northern kingdom and wrote in a distinctive northern dialect. During this period, Israel had six kings within 25 years (2 Kings 15:8 – 17:6), four of whom were murdered by their successors. The last one, Hoshea, was captured by king Shalmaneser of Assyria, and taken into exile. According to the biblical account, these kings all did evil in God’s sight among increasing political and religious decadence. 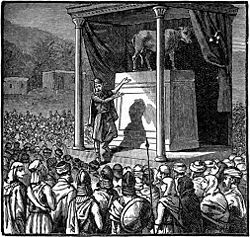 A particular complaint was the continued support of the national shrines at Dan and Bethel, instituted by Jeroboam I (see 1 Kings 12.26-30; Hose 8.4-6) and Baal. Hosea was also a contemporary of Isaiah, although Isaiah's prophecies were directed primarily towards the Southern Kingdom of Judah. The book may be divided into two parts, the first containing chapters 1-3, narrating Hosea's family life symbolically representing the idolatry of Israel. Obeying God's command, Hosea marries a prostitute, Gomer, as the Lord said, "The people in this land have acted like prostitutes and abandoned the Lord." The figures of marriage and adultery are common in the Hebrew Bible as representations of the relationship between God and the people of Israel. However, in Hosea's case, the prophet is asked to stand, as it were, in God's place by being married to a woman who is neither pure nor faithful. The second part, consisting of chapters 4-14, is a compendium of Hosea's prophecies, filled with denunciations, threatenings, exhortations, promises, and revelations of mercy. The unique contribution of Hosea is the extended metaphor of marriage in chapters 1-3. First, Hosea is directed by God to marry a harlot, and he does so. Marriage here is symbolic of the covenant relationship between God and Israel, particularly the northern Kingdom of Israel, also referred to by Hosea as Ephraim. Israel has been unfaithful to God by following other gods and breaking the commandments which are the terms of the covenant. Hence she is symbolized by a wife who violates the obligations of marriage to her husband. Interestingly, Hosea specifically denounces the massacre carried out by King Jehu against the descendants of Ahab and Jezebel (2 Kings 10:11), carried out at the behest of none other than the earlier prophet Elisha (1 Kings 9). Third, then Gomer gives birth to a daughter. God commands that she be named Lo-ruhamah—"No Pity"—to show Israel that, although God will still have pity on the Kingdom of Judah, He will no longer have pity on the Kingdom of Israel; its destruction is imminent. Fourth, a son is born to Gomer. It is questionable whether this child was Hosea's, for God commands that his name be Lo-ammi—"Not My People." The child bore this name of shame to show that Israel would also be shamed, for its people would no longer be known as God's people. Following this, the prophecy is made that someday this will all be changed: "The people of Judah and the people of Israel will be reunited, and they will appoint one leader and will come up out of the land." (1:11) It may be that Hosea saw his son as this very messianic figure—"for great will be the day of Jezreel"—although the passage may also be interpreted as related to the place rather than the person. Chapters 4-14 spell out the allegory at length in various prophetic utterances. Chapters 4-10 contain a series of oracles, or prophetic sermons, showing exactly why God is rejecting Israel, what are the grounds for the "divorce." Various specific grievances are cited: adultery, stealing, murder, prostitution, financial corruption and especially idolatry (ch 4). An attempt to ally Assyria will prove futile, as both Judah and Israel are defiled (ch 5-6). "I desire mercy, not sacrifice," God famously says through the prophet, "and acknowledgment of God rather than burnt offerings." (6:6) Ephraim (Israel) is criticized for "mixing" with other nations, and vacillating between Egypt and Assyria (ch. 7). The "calf-idol" of Samaria is denounced (ch. 8), probably referring to the nation shrine at Bethel, Samaria being the northern capital. Although the north may be externally prosperous, this glory is fleeting (ch. 9), and Bethel itself will one day be devastated (ch. 10). God laments over the necessity of giving up the northern kingdom whom God loves (ch. 11). However, God promises not to give them up entirely. The prophet pleads for Israel's repentance (ch 12) but foretells the impending destruction of the kingdom at the hands of Assyria, because there has been no repentance (ch 13). In Chapter 14, the prophet urges Israel to seek forgiveness, and promises its restoration, while urging the utmost fidelity to God. During Hosea's lifetime, the kings of the Northern Kingdom, their aristocratic supporters, and the priests had led the people away from the Law of God, as given in the Pentateuch. Although they did necessarily reject Israel's God entirely, they worshiped other gods as well, especially Baal, the Canaanite fertility deity. The prophet, however was not only concerned with religious sins, for he denounced other violations of the Mosaic Law as well: murder, perjury, theft, and sexual sin. Hosea declared that, unless the people of Israel repented of these sins, God would allow their nation to be destroyed, and the people will be taken into captivity by Assyria (Ho 9.3; 11.5), the greatest nation of the time. In fact, Assyria did capture Samaria, the capital of the Northern Kingdom, in 722 B.C.E. All the members of the upper classes and many of the ordinary people were taken captive and carried off to live in exile. Sadly, Hosea's prophecy that one day the northern and southern kingdoms would one day unite and seek "David their king," did not come to pass. History of "Hosea, Book of"
This page was last modified on 18 December 2018, at 22:27.